Is there any relationship between human foamy virus infections and familial Mediterranean fever? Background: Familial Mediterranean fever (FMF) is generally defined as an autosomal recessive disease, characterized by the automatic activation of the innate immune system in the absence of a detectable pathogenic stimulant. We hypothesize that the pathogenic factors, besides the genetic causes, may affect the development of FMF symptoms. To test this hypothesis, we examined the effects of human foamy virus (HFV) positivity on the occurrence of the clinical symptoms of FMF. Materials and Methods: Two hundred and twenty-two FMF patients with definitive diagnosis according to Tel Hashomer criteria (study group 1 [SG1]), 205 symptomatic FMF patients who had definitive diagnosis according to the same criteria but did not carry any of the 12 most commonly occurring MEFV gene mutations (study group 2 [SG2]), and 200 healthy individuals were included as control group (study group 3 [SG3]) in the study. The genetic analysis was applied in the Molecular Genetics Laboratory of the Department of Medical Biology, Faculty of Medicine, Ondokuz Mayıs University. This study was designed as a case-control study. HFV positivity was tested by amplifying the HFV bel1 gene sequence with polymerase chain reaction technique. Statistical analyses were conducted using SPSS version 23.0 software. Results: HFV positivity showed significant differences between the study groups (P = 0.002). While 43 (19.02%) of the 222 SG1 patients were positive for the HFV bel1 gene sequence, 33 (16.09%) of the 205 SG2 patients were positive for the same sequence. Only 15 (7.5%) of the SG3 participants were positive for the presence of HFV bel1 gene sequence. Conclusion: The results of our study suggested that HFV positivity can be a stimulant pathogenic factor of natural immune system which can cause the emergence of FMF symptoms. Familial Mediterranean fever More Details (FMF; MIM 249100) is a prototype and the most common one of the Mendelian autoinflammatory diseases. FMF is generally inherited as an autosomal recessive manner. For some affected individuals, the family history of FMF is consistent with an autosomal dominant manner of inheritance. In these families, presumed heterozygotes manifest FMF within a phenotypic spectrum from mild to classic findings. FMF is characterized by short-term recurrent attacks of fever, serositis, arthritis, and localized inflammation in the absence of high-titer autoantibodies or antigen-specific T-lymphocyte., Progressive systemic amyloid A amyloidosis seen in some patients with FMF may cause renal failure and death. The innate immune system forms the first defense system against pathogens through pattern recognition receptors (PRRs) which recognize pathogen-associated molecular patterns. NLR family pyrin domain containing 3 (NLRP3), a member of Nod-like receptors which are cytosolic PRR, is a molecular complex enabling caspase-1 activation and plays an important role in antiviral immune response. The innate immune system response for various viruses such as influenza virus, Sendai virus, hepatitis C virus (HCV), and adenovirus occurs with interleukin (IL)-1β production through inflammasome activation. IL-1β expression in macrophages, microglial cells, and astrocytes has been reported to be triggered by a retroviral protein, human T-lymphotropic virus-1 transactivator protein. Through the activation of caspase-1, various viruses stimulate the secretion of IL-1β and increase the potential role of NLRP3 inflammasome in antiviral immunity response. A recent study has shown that human immunodeficiency virus-1 stimulates the expression of NLRP3, IL-1β, and caspase-1 in dendritic cells taken from healthy donors. Different studies have suggested that RNA viruses activate NLRP3 inflammasome. The pathophysiological role of MEFV gene mutations and the role of MEFV gene protein pyrin have not been fully understood. However, recent data indicate that the primary function of pyrin is the regulation of caspase-1 activation. The inflammatory phenotype of FMF is induced by nuclear factor kappa-light-chain-enhancer of activated B-cells, which is activated as a result of FMF-related mutations found in pyrin and by IL-1β, which is an important cytokine. There is proof that IL-1β, which is an inflammatory cytokine, is effective in the pathophysiology of FMF and also proof which shows the dysregulation of IL-1β production in FMF patients., The pyrin's N-terminal PYD domain shows homology with a great number of proteins which take part in apoptosis and inflammation. It is thought that wild-type pyrin binds to ASC, prevents it from joining caspase-1 activation, and inhibits IL-1β activation. Human foamy virus (HFV; also called spumaretrovirus) was isolated from the lymphoblastoid cells of a Kenyan patient with nasopharyngeal carcinoma by Achong et al. in 1971. In the following years, HFVs were isolated from patients with toxic encephalopathy, chronic myeloid leukemia, and some thyroid diseases. Anti-HFV antibodies were found in patients with De Quervain thyroid, nasopharyngeal carcinoma, amyotrophic lateral sclerosis, and multiple sclerosis. In addition, HFV positivity was shown in the peripheral lymphocytes of patients with Graves' disease and myasthenia gravis through polymerase chain reaction (PCR). In addition, a study from Japan assessing whether HFV was one of the assumed pathogens for idiopathic pulmonary fibrosis or other respiratory diseases examined the presence of HFV genes in the alveolar cell mRNA or genomic DNA isolated from the peripheral blood leukocytes of 320 patients with various lung diseases. HFV positivity was confirmed only in 3 out of 320 patients. Interestingly, all three HFV-positive patients were FMF patients. Although FMF is generally defined as an autosomal recessive disease, approximately 35% of the clinically defined FMF patients carry only one MEFV gene mutation and 10%–20% do not carry any MEFV gene mutation at all. Therefore, FMF diagnosis is made primarily according to clinical criteria. There are a great number of patients who do not carry MEFV gene mutation but clinically show FMF symptoms. Thus, there are reports stating that pathological factors, aside from genetic factors, may be effective in the development of this disease and inflammasomes are activated during viral infections. In the direction of study in Japan  and other studies, in this study we examined the involvement of HFV positivity on the occurrence of clinical symptoms of FMF. Different studies which examined the frequency of MEFV gene mutations have been conducted in Turkey and other countries. In one of these studies, it is stated that more than 85% of FMF patients in the Middle East had one of the five MEFV gene mutations: M694V, M694I, M680I, V726A, and E148Q. In their review, Federici et al. stated that five mutations made up 85% of all MEFV gene mutations. 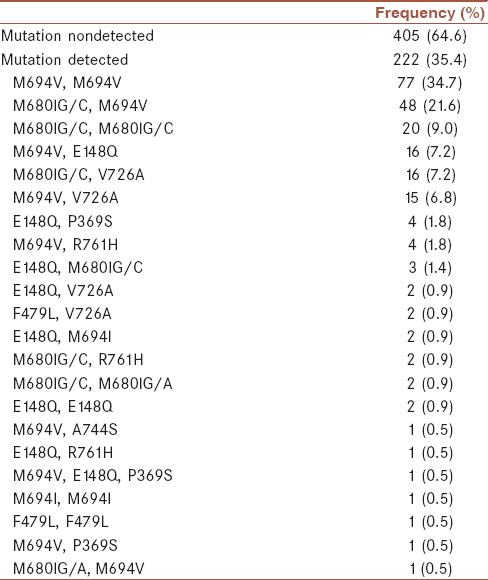 The most frequently reported mutations in Turkey were M694V, V726A, M680I, E148Q, R761H, and P369S. The frequency of these mutations in FMF patients is much higher when compared with other mutations. These studies showed that the 12 MEFV gene mutations scanned can make up a great majority (at least 95%) of MEFV gene mutations that may be seen in a population. This rate brings to mind the possibility that patients who did not carry any of the 12 MEFV gene mutations screened but who showed FMF phenotype according to Tel Hashomer criteria may be showing phenotype similar to FMF phenotype under the effect of different factors except the MEFV gene. Study groups were formed from individuals who were referred from different clinics for MEFV gene mutation analysis to the Molecular Genetics Laboratory of the Department of Medical Biology, Faculty of Medicine, Ondokuz Mayıs University. Three groups included in our study. Study group 1 (SG1), consisted of 222 patients who had a definitive diagnosis according to Tel-Hashomer criteria and carried two of the 12 mutations commonly seen in MEFV gene (E148Q, P369S, F479L, M680IG/C, M680IG/A, I692del, M694V, M694I, K695R, V726A, A744S, R761H). Study group 2 (SG2), consisted of 205 symptomatic FMF patients who had a definitive diagnosis according to the same criteria but did not carry any of the 12 mutations tested. 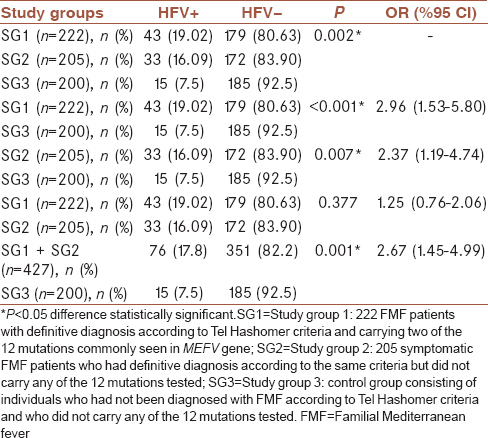 Study group 3 (SG3) included as control group consisted of 200 healthy individuals who had not been diagnosed with FMF according to Tel-Hashomer criteria and who did not carry any of the 12 mutations. This study was designed as a case–control study. Ethical Board approval was taken for the study from the Faculty of Medicine, Ondokuz Mayıs University. In addition, informed consents were obtained from patients and each FMF patient filled in an FMF information survey before giving a blood sample. The DNAs isolated from peripheral blood using Vivantis GF-1 Blood DNA Extraction Kit (Qiagen, Istanbul, Turkey, Cat#GF-BD-100) were tested for HFV bel1 gene sequence with PCR technique. PCR was conducted according to the procedure published in the 2006 article of Sun et al. HFV bel1 gene sequence positivity was determined by running PCR products in 4% agarose gel [Figure 1]. The plasmid DNA including the HFV genome, kindly donated by Prof. Dr. Dirk Lindemann (Dresden Technical University, Virology Institute, Germany), was used as positive control. Analyses of data were performed using the Statistical Package Program (SPSS, version 23.0, Chicago, IL, USA). Continuous data were given as mean ± standard deviation and median (minimum–maximum). Allele and genotype frequencies of patients and controls were compared with Chi-square test. Odds ratio and 95% confidence intervals were used for the assessment of risk factors. All P values were two-tailed and P < 0.05 was considered statistically significant. The Hardy–Weinberg equilibrium was evaluated by Chi-square test. In the study, 222 FMF patients who had a definitive diagnosis and who carried double mutations, 205 symptomatic FMF patients who had a definitive diagnosis but did not carry any of the 12 mutations, and 200 controls were examined for the presence of the HFV bel1 gene sequence. In the SG1, there were 119 males (53.6%) and 103 (46.4%) females. There were 89 (43.4%) males and 116 (56.6%) females in the SG2. In the control group (SG3), there were 103 males (51.5%) and 97 (48.5%) females. The demographical characteristics of study groups are presented in [Table 1]. 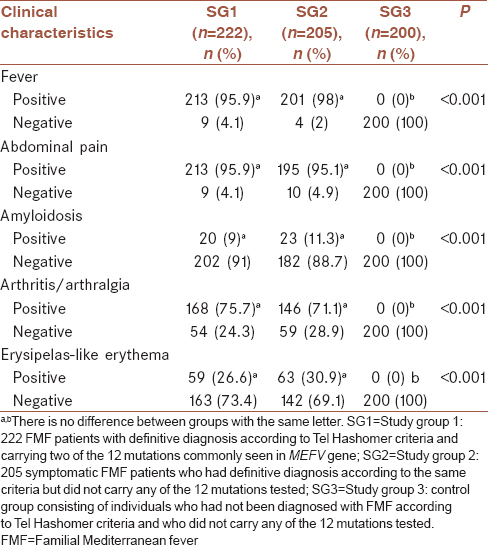 The clinical features of FMF patients who had a definitive diagnosis according to Tel Hashomer criteria were shown in [Table 2]. In terms of clinical findings (fever, abdominal pain, amyloidosis, arthralgia, and erysipelas-like erythema), SG1 and SG2 were found to be statistically significantly different than SG3 (P < 0.001). There was no difference between SG1 and SG2. [Table 3] shows the genotype distribution in patients who carry mutation in MEFV gene (homozygote, heterozygote, and compound heterozygote). A statistically significant difference was found between FMF patient groups and the control group regarding the HFV frequency [Table 4]. According to the results of our study, while 43 (19.02%) of 222 patients in the SG1 were HFV (+), 179 (80.63%) were HFV (−). While 33 (16.09%) of 205 patients in the SG2 were HFV (+), 172 (83.90%) were HFV (−). Of the 200 healthy controls, 15 (7.5%) were HFV (+), while 185 (92.5%) were HFV (−). When the three groups were assessed with regard to the presence of HFV, the difference was found to be statistically significant (P = 0.002). As can be seen in [Table 4], when the SG1 and SG3 were compared, the difference was found to be statistically significant (P < 0.001). While HFV was found in 19.02% of the patient groups with mutation, it was found in 7.5% of the healthy controls. When SG2 and SG3 were compared, the difference was found to be significant (P = 0.007). Symptomatic FMF patients were found to have higher frequency of HFV when compared with healthy controls. When SG1 and SG2 were compared, no statistically significant difference was found (P = 0.377). However, HFV positivity was found to be higher in FMF patients carrying two of the 12 mutations commonly seen in MEFV gene when compared with symptomatic FMF patients who did not carry any of the 12 mutations tested (19.02% and 16.09%, respectively). When the SG1 and SG2 were compared together with the SG3 regarding the HFV positivity, the frequency of HFV (+) was higher in the SG1 and SG2, and the difference was statistically significant (P = 0.001). FMF, an autoinflammatory disease, is very common in Turkey. Although it is accepted as an autosomal recessive disease, there are a great number of patients who do not have any MEFV gene mutations. Thus, findings have been reported which implicate that pathological factors in genetic-negative patients may be effective in the appearance of this disease. HFV was isolated from the cell culture of a Kenyan nasopharyngeal carcinoma patient. This strain is now accepted as prototype foamy virus (PFV), but its origin is not fully determined. Bel1, the transactivator of PFV, plays an important role in the replication of HFV. HFV genome includes three important retroviral genes as gag, pol, and env. It also includes other genes which encode transactivation proteins which are called bel1 (tas), bel2, bel3, and bet. Viral Bell transactivator protein encoded by Bel1 open reading frame has been found to be effective in cell lines acquired from humans, monkeys, mice, and birds.Bel1 gene product has been defined as a transcriptional transactivator for the transcription led by long terminal repeat (LTR) and it has been shown to be necessary for viral replication and gene expression. Since it is obligatory for transcription from LTR and internal promoters, bel1 is important for infection. One study showed that HFV (HSRV)-specific bel1 and bet gene deletions removed the infectivity of pHSRV 13 clone. The results of these two studies show that bel1 gene is required for viral replication and gene expression. In a study conducted by Bothe et al. in 1991, transgene was expressed in the central nervous system, smooth muscle, and striated muscle tissues of transgenic mice which carried HFV bel1 region under LTR's transcriptional control and progressive degenerative disease developed in the central nervous system and striated muscle tissues of these animals. Researchers suggest that transgene expression may be closely related with structural damage and inflammatory reactions. These results imply that HFV may be pathogenic in humans. HFV is one of the complex retroviruses, and retrovirus infections are indicated as among possible etiological factors for autoimmune rheumatic diseases. In one study, the presence of HFV proviral genome was analyzed by PCR from the thymus samples of four patients with myasthenia gravis, and the results showed the presence of DNA fragments which represented gag and bel2 sequences in all samples. These findings show the potential role of HFV in autoimmunity. However, researchers have stated the need for further studies. In a study conducted for spumaretrovirus infection markers, 29 Graves patients and 23 controls were studied, and virus positivity in peripheral lymphocytes was shown with PCR. As a conclusion, researchers put forward that there was a strong association between Graves' disease and the presence of HSRV-associated infection markers. In our study, we looked at the involvement of HFV positivity in the appearance of FMF symptoms. In this context, when the study groups were compared, a statistically significant difference was found between the groups for HFV positivity (P = 0.002). While 43 (19.02%) of the 222 SG1 patients were positive for the HFV bel1 gene sequence, 33 (16.09%) of the 205 SG2 patients were positive for the same sequence. Only 15 (7.5%) of the SG3 participants were positive for the presence of HFV bel1 gene sequence. To sum it all up, our results showed that the HFV bel1 gene sequence was present in 19.02%, 16.09%, and 7.5% of the participants of the SG1, SG2, and SG3, respectively. When the SG1 and SG3 were compared for the presence of the HFV bel1 gene sequence, the difference between these two groups was statistically significant (P < 0.001). When the SG2 and SG3 were compared, the difference between these two groups was also statistically significant (P = 0.007). The high frequency of the HFV bel1 gene sequence positivity in the SG2 compared with the SG3 suggests that this pathogenic agent may affect the appearance of FMF symptoms. When the SG1 and SG2 were compared, although HFV positivity was found to be higher in SG1 (19.02%, 16.00%), the difference between was not found to be statistically significant (P = 0.377). When the SG1 and SG2 together (222 + 205 = 427 patients) were compared with the SG3, HFV positivity was found in 17.8% of the patients (SG1 and SG2), while they were found in only 7.5% of the control group (SG3). Again, the difference was statistically significant (P = 0.001). In general, when FMF patients with two of the 12 mutations commonly seen in MEFV gene and symptomatic FMF patients who did not carry any of the 12 mutations tested were compared with healthy controls, statistically significant differences were found in terms of HFV positivity. FMF has been defined as a disease resulting from the mutations in MEFV gene and characterized by the automatic activation of natural immune system, in the absence of a pathogenic stimulant. The results of our study show that HFV positivity can be a stimulant pathogenic factor of natural immune system which can cause the emergence of FMF symptoms. This is the first report in the literature that links HFV positivity with the appearance of the FMF symptoms. The product of the MEFV gene, pyrin protein, consists of the N-terminal pyrin domain, also called PYD, PAAD, or DAPIN, which is a member of death effector-fold domain, central B-box, coiled-coil domain, and C-terminal B30.2/SPRY domain. Pyrin domain can also be found in most of the proteins with a role in controlling inflammation and in NALP proteins. NALP3 protein, which is one of the NALP proteins, plays a key role in controlling the inflammasome which regulates caspase-1 activation and IL-1β processing, the two main mediators of inflammation. NLRP3 activation can be triggered with response to various stimuli such as microbial, endogenous (endogenous danger signals), and exogenous microbial (crystalline particles) origins. Fungi such as Candida albicans, bacteria such as Staphylococcus aureus and Listeria monocytogenes, and viral infections such as Sendai and influenza viruses have been shown to activate NLRP3 inflammasome. Recently, it has been shown that HCV RNA triggers the activation of NLRP3 inflammasome. Thus, it is a possibility that HFV infection can trigger NLRP3 inflammasome activation, and thus, it can influence the emergence of symptoms in FMF patients with mutation or in symptomatic FMF patients who do not have mutation. Since this is a retrospective study, we could not assess whether the patients had FMF attacks or virus infection previously when blood samples were taken for genetic test. FMF is a very common disease in our country, and hence, finding the definitive cause has diagnostic importance. Although FMF is a disease which shows single gene heredity, the accumulated data indicate the involvement of factors other than the MEFV gene mutations in the occurrence of the FMF symptoms. Our results suggest that although FMF shows single gene heredity, not only MEFV gene mutations but also viral factors may play a role in the emergence of the clinical picture of FMF. We would like to thank the patients, researchers and laboratory technicians, and especially Prof. Dr. Dirk Lindemann (Dresden Technical University, Virology Institute, Germany) who donated the plasmid DNA which includes HFV genome that was used as positive control in our study, and we also thank laboratory workers for their contributions to DNA isolation. This work was supported by Ondokuz Mayıs University Scientific Research Funding (PYO. TIP. 1904.12.002), and Ondokuz Mayıs University Ethical Board approval was taken. Chae JJ, Cho YH, Lee GS, Cheng J, Liu PP, Feigenbaum L, et al. Gain-of-function pyrin mutations induce NLRP3 protein-independent interleukin-1β activation and severe autoinflammation in mice. Immunity 2011;34:755-68. Taylan A, Yildiz Y, Sari I, Ozkok G. Vasculitis and long standing ankylosing spondylitis in a patient with familial mediterranean fever. J Res Med Sci 2014;19:1009-11. Chae JJ, Aksentijevich I, Kastner DL. Advances in the understanding of familial mediterranean fever and possibilities for targeted therapy. Br J Haematol 2009;146:467-78. Hesker PR, Nguyen M, Kovarova M, Ting JP, Koller BH. Genetic loss of murine pyrin, the familial mediterranean fever protein, increases interleukin-1β levels. PLoS One 2012;7:e51105. Repa A, Bertsias GK, Petraki E, Choulaki C, Vassou D, Kambas K, et al. Dysregulated production of interleukin-1β upon activation of the NLRP3 inflammasome in patients with familial mediterranean fever. Hum Immunol 2015;76:488-95. Centola M, Wood G, Frucht DM, Galon J, Aringer M, Farrell C, et al. The gene for familial mediterranean fever, MEFV, is expressed in early leukocyte development and is regulated in response to inflammatory mediators. Blood 2000;95:3223-31. Mohammad Hosseini A, Majidi J, Baradaran B, Yousefi M. Toll-like receptors in the pathogenesis of autoimmune diseases. Adv Pharm Bull 2015;5:605-14. Wang C, Shi X, Zhang X, Wang A, Wang L, Chen J, et al. The endoribonuclease activity essential for the nonstructural protein 11 of porcine reproductive and respiratory syndrome virus to inhibit NLRP3 inflammasome-mediated IL-1β induction. DNA Cell Biol 2015;34:728-35. Kamada AJ, Pontillo A, Guimarães RL, Loureiro P, Crovella S, Brandão LA, et al. NLRP3 polymorphism is associated with protection against human T-lymphotropic virus 1 infection. Mem Inst Oswaldo Cruz 2014;109:960-3. Hernandez JC, Latz E, Urcuqui-Inchima S. HIV-1 induces the first signal to activate the NLRP3 inflammasome in monocyte-derived macrophages. Intervirology 2014;57:36-42. Rajan JV, Rodriguez D, Miao EA, Aderem A. The NLRP3 inflammasome detects encephalomyocarditis virus and vesicular stomatitis virus infection. J Virol 2011;85:4167-72. Meinzer U, Quartier P, Alexandra JF, Hentgen V, Retornaz F, Koné-Paut I, et al. Interleukin-1 targeting drugs in familial mediterranean fever: A case series and a review of the literature. Semin Arthritis Rheum 2011;41:265-71. Basaran O, Uncu N, Celikel BA, Aydın F, Cakar N. Assessment of neutrophil to lymphocyte ratio and mean platelet volume in pediatric familial mediterranean fever patients. J Res Med Sci 2017;22:35. Dinarello CA. A clinical perspective of IL-1β as the gatekeeper of inflammation. Eur J Immunol 2011;41:1203-17. Achong BG, Mansell PW, Epstein MA. A new human virus in cultures from a nasopharyngeal carcinoma. J Pathol 1971;103:P18. Sun KH, Lin HY, Chen LW, Tai HY, Lin ML, Feng CK, et al. Human foamy virus bel1 sequence in patients with autoimmune rheumatic diseases. Clin Rheumatol 2006;25:694-9. Tamura N, Kira S. Human foamy virus and familial mediterranean fever in Japan. JAMA 1995;274:1509. Ben-Zvi I, Herskovizh C, Kukuy O, Kassel Y, Grossman C, Livneh A, et al. Familial mediterranean fever without MEFV mutations: A case-control study. Orphanet J Rare Dis 2015;10:34. Ben-Chetrit E, Touitou I. Familial mediterranean fever in the world. Arthritis Rheum 2009;61:1447-53. Federici S, Caorsi R, Gattorno M. The autoinflammatory diseases. Swiss Med Wkly 2012;142:w13602. Uluca Ü, Ece A, Şen V, Coşkun S, Güneş A, Yel S, et al. High frequency of E148Q sequence variation in children with familial mediterranean fever in Southeast Turkey. Arch Argent Pediatr 2015;113:133-9. Murray SM, Linial ML. Foamy virus infection in primates. J Med Primatol 2006;35:225-35. Ma QL, Yu M, Luo D, Tan J, Qiao WT. Identification of prototype foamy virus bel1 nuclear localization signal and its corresponding importins. Bing Du Xue Bao 2014;30:346-52. Rethwilm A, Erlwein O, Baunach G, Maurer B, ter Meulen V. The transcriptional transactivator of human foamy virus maps to the bel 1 genomic region. Proc Natl Acad Sci U S A 1991;88:941-5. Keller A, Partin KM, Löchelt M, Bannert H, Flügel RM, Cullen BR, et al. Characterization of the transcriptional trans activator of human foamy retrovirus. J Virol 1991;65:2589-94. Löchelt M, Muranyi W, Flügel RM. Human foamy virus genome possesses an internal, bel-1-dependent and functional promoter. Proc Natl Acad Sci U S A 1993;90:7317-21. Löchelt M, Zentgraf H, Flügel RM. Construction of an infectious DNA clone of the full-length human spumaretrovirus genome and mutagenesis of the bel 1 gene. Virology 1991;184:43-54. Bothe K, Aguzzi A, Lassmann H, Rethwilm A, Horak I. Progressive encephalopathy and myopathy in transgenic mice expressing human foamy virus genes. Science 1991;253:555-7. Liu WT, Kao KP, Liu YC, Chang KS. Human foamy virus genome in the thymus of myasthenia gravis patients. Zhonghua Min Guo Wei Sheng Wu Ji Mian Yi Xue Za Zhi 1996;29:162-5. Lagaye S, Vexiau P, Morozov V, Guénebaut-Claudet V, Tobaly-Tapiero J, Canivet M, et al. Human spumaretrovirus-related sequences in the DNA of leukocytes from patients with graves disease. Proc Natl Acad Sci U S A 1992;89:10070-4. Papin S, Cuenin S, Agostini L, Martinon F, Werner S, Beer HD, et al. The SPRY domain of pyrin, mutated in familial mediterranean fever patients, interacts with inflammasome components and inhibits proIL-1beta processing. Cell Death Differ 2007;14:1457-66. Chen IY, Ichinohe T. Response of host inflammasomes to viral infection. Trends Microbiol 2015;23:55-63.